The Montgomery Improvement Association (MIA) was established on December 5, 1955 in Montgomery, Alabama as a grassroots movement to fight for civil rights for African Americans and specifically for the desegregation of the buses in Alabama’s capitol city. The MIA was the first of its kind, an organization based in the Deep South that specifically adopted a direct action tactic (a bus boycott) to challenge racial discrimination. The MIA was also the first predominately black civil rights organization to operate independently of the National Association for the Advancement of Colored People (NAACP). Although the MIA was not the catalyst to the Montgomery bus boycott, it played a significant role in the success of the protest and the desegregation of the buses, a year later. The MIA took responsibility for maintaining the boycott and the morale of the protesters and was in charge of providing alternative transportation for those who refused to ride the buses. Its car pools formed an effective means for the most impoverished black employees who could not walk to work to continue their employment. 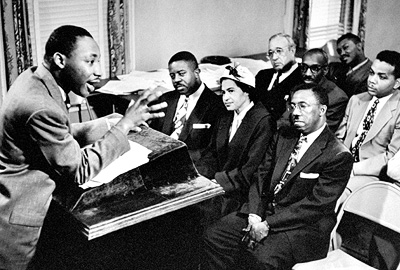 The MIA was organized primarily by local civil rights leaders E.D. Nixon and Jo Ann Robinson. Association leaders soon realized that a young minister, Martin Luther King, Jr. of the Dexter Avenue Baptist Church, would be an articulate spokesperson for their organization and the boycott. Moreover King, as a minister of an all-black church, was much more capable of resisting attempts at retaliation from the white Montgomery business and political establishment. Moreover, the election of a minister to head a black civil rights organization in the South was unusual in 1955 although it would become far more common following the success of the boycott. While King negotiated with city officials and the Montgomery Bus Company, other MIA leaders focused on fund-raising, garnering outside support, and formulating legal strategies. Finally, with the help of NAACP lawyers, in December 1956 the United States Supreme Court voided Alabama’s bus segregation laws in Browder v. Gayle. On December 21, 1956 black and white people seated themselves on city buses without regard to race. After the MIA had succeeded in its original goal of desegregating the buses, it continued to engage in voter-registration drives, student sit-ins, and other civil rights protests until its demise in 1969. Jo Ann Gibson Robinson, The Montgomery Bus Boycott and the Women Who Started it (Knoxville: University of Tennessee Press, 1987); Nina Mjagkij, Organizing Black America: An Encyclopedia of African American Associations (New York: Garland Publishing, Inc., 2001). Associations (New York: Garland Publishing, Inc., 2001).